Trifle desserts virtually shout, “Try me, I’m scrumptious.” Plus, trifles don’t have to be as complicated to make as expected. If your kitchen prep minutes are at a premium, borrow an idea from a friend in Louisiana, Susan Munson, who is an imaginative cook/hostess. She creates wonderful desserts based on easy-to-use, store-bought angel food cakes. Munson’s desserts never fail to impress even though they are simple and inexpensive to make. I decided to follow her advice and substituted an angel food cake for the sponge cake called for in a traditional trifle recipe. The streamlined trifle was gorgeous. I’ve served it a couple of times since and adjusted the amount of amaretto used to suit taste preferences. It’s lighter and sweeter with less amaretto. 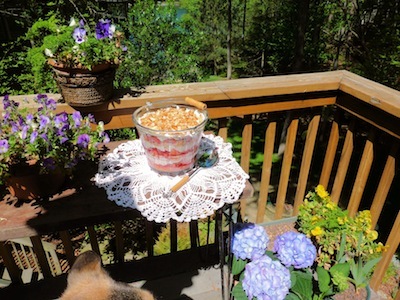 If you don’t have a trifle bowl, a punch bowl or glass salad bowl works fine. This is a showy dessert and you can put it together the night before your occasion. Combine strawberries, 1 cup amaretto, and 3 tablespoons sugar in a bowl. Mix gently. Cover and refrigerate. Beat softened cream cheese with ½ cup sifted confectioners’ sugar until smooth. Add remaining cup of amaretto and 1 teaspoon vanilla and continue beating until well combined. In separate bowl, beat whipping cream with remaining ½ cup sifted confectioners’ sugar and remaining vanilla until cream is thickened and fluffy. Add whipping cream mixture to the cream cheese mixture and beat until smooth. Toast almonds in 1 tablespoon butter and set aside to cool. Slice angel food cake horizontally into three equal layers. Arrange one layer of the cake in the bottom of a trifle dish. Spoon 1/3 of strawberry mixture over the cake, allowing juice to soak into cake. Spread 1/3 of cream cheese mixture over strawberries. Layer remaining cake, strawberries, and cream cheese. Top final cream cheese layer with toasted almonds. Chill covered until serving time. Garnish and serve.